The Multiple Gun Motor Carriage M13 is a Rank I American self-propelled anti-aircraft gun with a battle rating of 1.3. It is one of the first American tanks to be released with the American ground tree in Update 1.45 "Steel Generals". 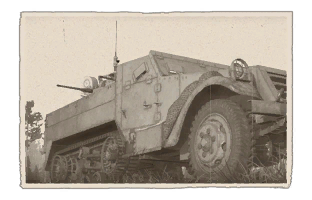 The M13 MGMC is a M3 half-track with a dual-mounted .50 calibre M2 Browning machine guns on rear. The .50 calibre machine guns are mounted in a Maxson M33 Twin Mount. Each machine gun has 200 rounds each, giving it a total of 400 rounds before reloads. The M13 is foremost an SPAA. As such, it relies on its mobility and fire rate to destroy aircraft, or very thinly-armoured tanks. However, when compared to other tanks of its rank, the M13 is a relatively weak vehicle. The MG-only armament gives the M13 exceptional AAA potential, but not much else. Since every bullet is a tracer makes killing aircraft much easier and detect-ability is not greatly increased over AP-I, however is increased a bit over AP. Ammo racks of the M13 MGMC. With the M13, the armour is very thin, and the lack of sloping makes the M13 an extremely easy target. Therefore, rely on the exceptional maneuverability, handling, and speed to either stay in cover or flank weaker tanks. Always relocate when faced with an artillery barrage as the shells will tear the thinly-armoured vehicle apart. Against planes, basic aiming rules apply. Fighters may target you due to the sole designation of SPAA. Hence, always remain on the lookout for enemy aircraft. Strafing aircraft can be extremely deadly; stay in cover and lead your target. The M2s have exceptional AAA ability, take use of their tendency to set opponents alight. Against tanks, flanking and hit and run are a must. The high rate of fire, good handling/mobility, and turret traverse make the M13 a wonderful hit-and-run tank. 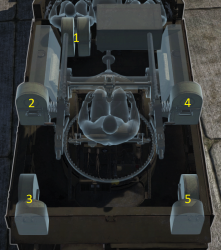 Aim for crew hatches and weak points in armour. Many times the high fire rate and penetration can easily knock out a crew of sublime armour. However, against better-armoured tanks such as the T-26 or M3 Lee, always stay out of the line of fire and try to avoid tanks such as these altogether. M2 MGs are effective against thinly-armoured vehicles (BT-5, Pz. IIC, etc.). Maximum reverse speed is 16 km/h (10 MPH). Can turn in place, as compared to the 4M GAZ-AAA . Can penetrate the sides and rear of most contemporary vehicles. Respectable reload rate for a trained crew. Traverse rate is acceptable for its peers. AP-T rounds are the same as on the P-51 D models, and are extremely effective against planes and thinly armoured vehicles alike. Armour is extremely thin- coaxial guns attached to other tanks can easily knock out crew. Crew exposed - easily taken out by tanks. Gun does very little damage to heavily armoured vehicles/tanks. Bullets are small and individually may do little or no damage even if they hit a module. Vulnerable to all cannon shells. Artillery strikes can easily destroy this vehicle. The changing concept of warfare ever since aircrafts were introduced into combat led to the role of the anti-aircraft. As such, the US Army submitted a request for the development of a mobile anti-aircraft vehicle to defend themselves against enemy aircrafts. Development didn't start until October 1940 to build such a vehicle, with the purpose to protect mechanized troops from airstrikes. The first build up was a 4x4 truck with an anti-aircraft armament of two .50 cal M2 Browning machine guns, this was called the T1. 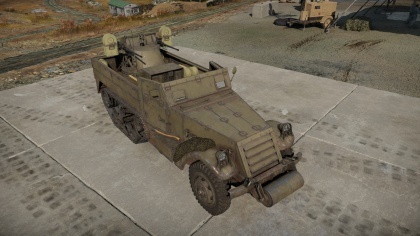 The development went on with T1E1 with a Bendix mount on a M2 half-track car and the T1E2 with the Maxson mount. T1E3 had a electro-dynamic aircraft turret made for bombers from the Glenn L. Martin Company. Of these three, the T1E2 was selected for further development. The turret design on the T1E2 was placed onto the longer M3 half-track for more ammunition storage. This design, known as the T1E4, was accepted into service as the M13 Multiple Gun Motor Carriage in July 27, 1942. A total of 1,103 units were produced from that day until May 15, 1943, though about 583 units were converted to the M16 MGMC before being delivered. First deliveries came in late 1943. The M13 saw service during the Italian Campaign in the landing at Anzio in January 1944. It served as an anti-aircraft weapon for the initial landings and then later as a ground support role by firing at ground troops and vehicles. The M13 GMC only saw service here, as they were replaced three months later by the newer and better M16 MGMC vehicle, which had four .50 cal machine guns rather than two. Only 139 units of the M13 GMC were deployed overseas by the army. This page was last edited on 28 January 2019, at 00:45.